1. Go to Windows Explorer, right-click on your hard drive name (e.g. C:) and select Properties. 2. Untick the 'Allow Indexing Service to index this disk for fast file searching'. 3. Select 'Apply changes to [Drive letter]\, subfolders and files' in the subsequent prompt. 4. Your system will now go through and remove all indexing on existing files, and not index any new or moved files in the future - this will speed up drive read/writes and general responsiveness. Ignore any 'errors' which are shown, this occurs simply because some files are in use or protected and can't have their properties changed to remove indexing - this is normal. Make sure you also disable the 'Indexing Service' service as it is no longer necessary when disk indexing is removed from your hard drive. I strongly suggest you get into the habit of defragmenting often, specifically after you delete or add large files or install software. I personally leave the Prefetcher registry setting above at its default of 3, and set the Task Scheduler service to Disabled. This means the prefetcher won't create application prefetch files under the Window\Prefetch directory. I also clear all out existing prefetch (.PF) files in that directory. I have found that this provides for the fastest Windows bootup time. For fastest performance, I recommend deselecting everything except 'Use visual styles on windows and buttons' and 'Use drop shadows for icon labels on the desktop'. That will reduce usage of system resources for graphical effects, while still retaining the majority of Windows XP's trademark appearance. This is where you can set the size of your pagefile. To determine the optimal pagefile size you should ideally see how much memory your most memory intensive programs use and then set the pagefile to comfortably accommodate this. Before setting a new pagefile size, first clear your existing pagefile. To do this select the 'No Paging File' option and click the Set button, then reboot your system. This step does two things: first it deletes the pagefile, fixing any potential pagefile corruption which can occur after a bad shutdown (remember this tip for future troubleshooting purposes); and secondly it ensures that any new pagefile you create will start off as a single unfragmented contiguous block on your hard drive for optimal performance, which will remain unfragmented in the future. Note that if you have any problems booting up into Windows due to a lack of a pagefile during this step, enter Windows in Safe Mode (See Backup & Recovery section) and continue the setup procedures for Virtual Memory from there. Set the Initial and Maximum pagefile sizes to 2560MB each - i.e. allocate 2.5GB for the pagefile. Whatever you do, don't set a zero pagefile. For a system with a single operating system, select '"Microsoft Windows XP [Home/Professional]" /fastdetect' in the list presented. If you only have one operating system, or you don't want to select a different operating system each time you boot up, untick the 'Time to display list of Operating Systems' option. Under the 'System failure' section untick all three options for optimal performance, and the 'Write Debugging Information' option should be set to None. That way if you run into problems you'll see the error displayed (usually a Windows Blue Screen of Death (BSOD) message) and your system won't automatically reboot. At the same time you won't get lots of logfiles and dumpfiles of the event cluttering up your hard drive. Click the Error Reporting button and select 'Disable Error Reporting' and tick 'But notify me when critical errors occur'. This will prevent your system continually informing Microsoft of errors occurring on your system, but at the same time will still show you important system messages and errors for notification and troubleshooting purposes. I strongly recommend that you disable the available options in this section for security and performance reasons. I recommend 'Turn off Automatic Updates' and instead use the manual method of regularly checking the Windows Update site for updates. Disable as many sounds as possible as they take up system memory by being loaded into RAM at startup. It is recommended that the rest are unticked for best performance and functionality. Go to Run > msconfig and then choose the Startup tab. Examine the list and disable any items you do not want started when your computer boots e.g. ypager, iTunesHelper etc. This is the Pulitzer Prize winning photo taken in 1994 during the Sudan famine. It depicts a famine stricken child crawling towards a UN food camp, located a kilometre away. The vulture is waiting for the child to die so that it can eat it. This picture shocked the whole world. 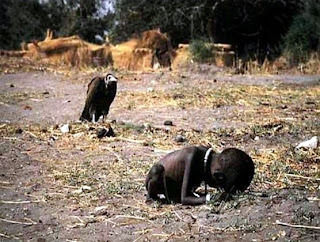 No one knows what happened to the child, including Kevin Carter, the photographer, who left as soon as the photo was taken. I promise I will never waste my food no matter how bad it can taste and how full I may be. I pray that He will protect this little boy, guide and deliver him away from his misery. I pray that we will be more sensitive towards the world around us and not be blinded by our own selfish nature and interests. I hope this picture will always serve as a reminder to us that how fortunate we are and that we must never ever take things for granted. Let's make a prayer for the suffering in anywhere any place around the globe and send this friendly reminder to others. Think and look at this when you complain about your food and the food we waste daily. Last week, I decided to add more memory to my Dell Inspiron 1150 laptop. Its about 3 years old now and only had 256MB RAM! To be honest, I should have added more memory ages ago, but just couldn't be bothered. I only use my laptop for email and internet anyway. I logged onto crucial.com and ordered a 1GB 200-PIN SODIMM 128Mx64 DDR PC2700 Pb-Free upgrade for my laptop. The total cost came to £68.14 (£57.99 + £10.15 tax) and it arrived the next day - I wasn't expecting such a speedy delivery! I unwrapped the new module and slid it into the empty slot at a 45-degree angle until it clicked into place. It required quite a bit of force. I then closed the cover, put the battery back in and powered up. As the computer booted, it detected the additional memory. I then went to Control Panel > System to check me new memory which was indeed 1.25GB. Its amazing how much difference this has made! All my applications, such as Firefox and Eclipse are so much more faster and the system as a whole is much more responsive.